Francisco Abdul Estin has worked at the Westin in Long Beach for 26 years as a banquet server. Francisco immigrated to the U.S. from Guatemala to seek a better life and provide a living for my wife and four children. He takes great pride in his work and has served many guests over the years in the Westin’s great banquet room. Although Francisco has worked hard and has been been loyal to the company for so many years he still lacks the dignity and respect on the job that he has earned as a worker. The work pace at the Westin is very fast. 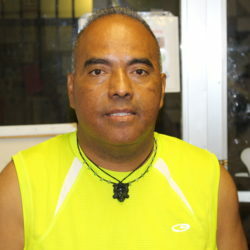 Although it is required by law that workers take a 10 minute break, Francisco often has to work through his breaks because he is rushing to serve customers. During nearly all of the 26 years that he has worked at the Westin, he has only been able to take his ten minute break a handful of times. In order to address these issues, Francisco led a delegation at the Westin with his co-workers to demand that their employer obey the law. As a member of the Long Beach Coalition for Good Jobs and Healthy Communities, he believes that Long Beach should be leading the way in setting the best standards for workers and creating a world class tourism industry that benefits Long Beach communities and strengthens the local economy.